To continue exploring Gdansk Old Town, we depart the High Gate, the entrance through which the Polish king passed when visiting Gdansk (pronounced “ɡə dænsk”). From the High Gate it’s a short distance along the Royal Route to the arch of the Golden Gate, the entrance to Long Street . Constructed in 1512, the Golden Gate is built of white stone and decorated with gold trim. Eight statues atop the wall represent traits varying from piety to wealth. The Gdansk coat of arms appears just above the archway. Returning to Long Street, we’re soon standing beside the imposing town hall dating back to the 13th century. A fire in the 1500’s created an opportunity to expand the town hall and to change its architectural style to Dutch/Flemish mannerism. The town hall is a grand building, five stories high and topped with a 272 foot-high tower. 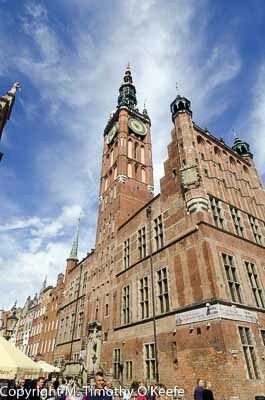 No longer the seat of local government, the town hall is home to the Historical Museum of Gdansk. A tour of the building and its magnificent halls isn’t possible today. Not enough time. A short distance beyond the town hall where Long Street changes into Long Market Street we find the famous Neptune Fountain from 1633. Now the symbol most identified with Gdansk, the Neptune Fountain was built to emphasize the city’s dependence on sea trade. Linda points out no one is throwing coins in the fountain. Maybe that’s due to the legend that Neptune grew so angry when people threw golden coins in his fountain he slammed his trident into the water with such power the gold coins changed into small golden flakes. Those flakes have been fluttering around a long time, said to still shine in the local vodka Goldwasser. Every bottle of the vodka contains small thin flakes of 22 or 23 karat gold, based on the belief gold has medicinal benefits. Whether gold is good for you is uncertain but at least the vodka’s tiny flakes won’t hurt you. Goldwasser purchased in Gdansk isn’t a great souvenir since it’s been made in West Germany for the past several decades. At the end of Long Market Street we arrive at the Green Gate, a building intended as a residence for visiting royalty. A wasted effort since only a single visitor appears to have used it, a woman stopping here briefly on her way to marry King Ladislaus IV. The Green Gate—named for the color of stone used in its construction—is managed by the Polish National Museum and houses numerous exhibitions and galleries. The Old Town river bank is lined with stores and popular outdoor cafes. Sticking out like a sore thumb is the mid-15th century medieval loading crane known as The Zuraw. The largest crane in Europe at the time, it could transfer loads up to 4400 pounds as well as install masts. The crane’s double towers make it the largest and most distinctive of Old Town’s waterfront gates. We wind our way past the river bank stores to the behemoth crane to take an inside look at the immense wooden wheel used to power the machine. The wheel was turned not by water power but by men literally walking inside the wheel, a job that must have been back-breaking. After inspecting the guts of the crane, we go partway back toward the bridge next to the Green Gate, turning right at narrow cobbled Mariacka Street. Stepping back into the Old Town, we wander the street known for its narrow three-story townhouses that feature individual front terraces, a rarity in Old Town. Mariacka Street is our gateway for visiting gigantic St. Mary’s Basilica. Constructed over an extended period from 1343 to 1502, the length of the church’s full name–the Basilica of St. Mary of the Assumption of the Blessed Virgin Mary–rivals the building’s colossal scale. One of Europe’s largest brick churches, St. Mary’s interior is immense, supposedly able to hold 25,000 people comfortably. Overpowering in its dimensions, the ginormous building and its soaring ceiling makes us feel totally insignificant. Light fills the whitewashed interior through 37 huge windows, some seemingly as large as an apartment building. With so much bare wall space, the church at first appears surprisingly empty. We soon realize it is handsomely decorated with crystal vaults and, closer to ground, numerous works of Medieval and Baroque art. Among the items not to miss are the high altar, the stone Pieta from 1410 and the large astronomical clock by Hans During. We’d like to climb the bell tower to enjoy its panoramic view of Gdansk but the price—400 steps–is too steep. Not us, not today. St. Mary’s was so overpowering it’s hard to imagine another church could interest us. But off to the right a few blocks away an old building catches our eye. Is it another church? It’s strange the exterior of such a large ancient building would be so darkly dreary, very uncharacteristic for Gdansk. Whatever it is, the inside is likely a dump but why not take a quick look? Entering the unknown building through a small out-of-the-way door, we find a small room where a woman mops the floor. At first surprised to see us, she steps back with a little bow, then points toward a small set of stairs leading to another door. This is odd. Is she sending us to some poorly lighted cellar? Well, it’s still light out and this isn’t Transylvania. We head downstairs into who knows what. At the most unexpected times the universe decides to bless you with something extraordinary. Opening the downstairs door, we pause, stunned at what we see. An old building that outside appears so dull and depressing contains possibly the most beautiful church either one of us has ever entered. By blind luck, we have found St. Nicholas Church, founded by Dominican monks in 1348. Not only is St. Nicholas one of the city’s oldest churches, it is the only church to escape damage in central Gdansk during World War II. How it remained unscathed is something of a miracle. Some say Russian bomber pilots refused to destroy the church because it was named after Russia’s own patron saint. Or that they spared St. Nicholas because the Russian Orthodox church had declared Tsar Nicholas II a saint after his assassination? Or was it pure chance the bombs missed, while an estimated 90 percent of the city around it was destroyed? Regardless of what happened during the bombing runs, once Russian troops were on the ground, they did not loot or burn St. Nicholas. Perhaps the church was left intact for the same reasons it wasn’t bombed. Or it was due to quick action by the church priest who reportedly bribed the soldiers with alcohol reserves from the church’s cellar to spare it. Somehow, the church and all of its 17th century contents survives untouched. 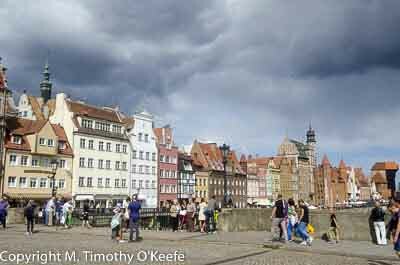 Which means that for the first time in Gdansk, everything we see is original and not a reproduction. This is an amazing sight. The mostly Baroque and Rococo interior of white marble interspersed with dark marble and deeply polished pews somehow harmonize to give the church a solemn and impressive air. Memorable decorations include a magnificent chandelier crafted in 1617, gold-framed paintings from the 15th to 18th centuries depicting the life of Christ, a Byzantine icon of the Madonna and an elaborately carved multi-level high altar. Linda feels she has stepped into a part of history that has been lost. She says the beauty here is overwhelming. Strangely, we are the only people present in the church. It’s been deathly quiet the entire time here. So we’re slightly spooked when the great organ behind us unexpectedly explodes into a loud hymn. 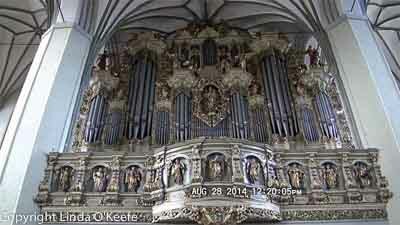 Turning around, we look upwards at the 17th century organ encased in Baroque and Rococo decorations. The hymn resonates throughout the building, humbling us. How lucky are we to have wandered in here during organ practice? As we leave, another couple wanders in, undoubtedly through the front door. We depart through the same side door, never seeing the front of St. Nicholas church. It is a shock later to see the church’s bright red exterior in online photos. It’s such a remarkable contrast to our drab entrance we wonder for a moment if we’d really been inside St. Nicholas. Online pictures of the interior confirm we were. We still find it strange so little tourist information about St. Nicholas was available in Gdansk. Leaving Gdansk, our cab navigates the traffic with no difficulty, which allows us time for a quick stop at the famous Monument to the Fallen Shipyard Workers located just outside the Gdansk shipyard gates. 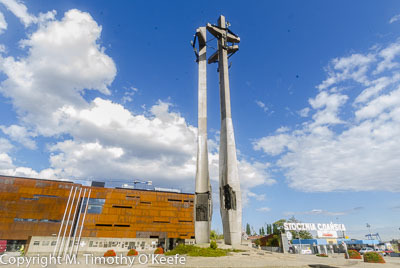 The memorial of three tall steel crosses rise 42 meters above the square to commemorate the deaths of 42 shipyard workers killed during a 1970 strike. The monument was erected in 1980 to satisfy demands of shipyard union leader Lech Walesa and his 17,000 member Solidarity Movement, the first non-communist union in Eastern Europe. The memorial was the first monument to victims of communist oppression ever erected in a communist country. It is credited as marking the beginning of the end of communist control in Eastern Europe. Of all the historic places in Gdansk, this is perhaps the most meaningful to Westerners. Next: Why we will never sail on Oceania again.